Integrated Systems Europe has revealed that globally renowned cyber-illusionist Marco Tempest will present the Keynote Address on the eve of ISE 2013. Titled ‘Inventing The Impossible’, Tempest’s presentation will address the use of illusion as a creative tool and how it can be used to bring seemingly impossible scenarios to life. Using examples of the magical illusion work Tempest has designed in collaboration with engineers, animators and programmers, the Keynote will focus on the envisaging of future technologies, the value of open-source projects, and how illusion can provide a gateway to social-media interactivity. “Marco Tempest has a worldwide reputation as an inspirational speaker whose use of computer-based imagery, augmented reality and other visual technologies is as original as it is breathtaking,” said Mike Blackman, managing director, Integrated Systems Events. “Whether they are combining multiple projected images to create a single animated canvas, building interactive kiosks for retail spaces or visitor attractions, designing multi-channel sound systems, or simply providing multimedia content for installed or live applications, ISE attendees are in the business of adding value by persuading people to suspend their disbelief." 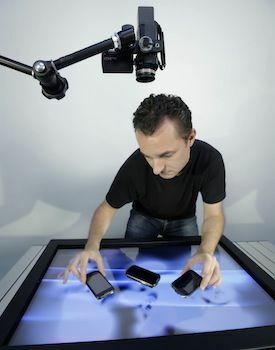 “Marco Tempest’s unique take on the use of illusion as a creative tool fits perfectly with ISE’s business and technology landscape, while his commitment to collaboration, creativity and enterprise could hardly be more topical,” Blackman added. Tempest’s Keynote Address will begin at 18:00 on Monday, January 28, 2013, and will be located in the Forum of ISE’s Amsterdam RAI show venue. The Keynote will be followed at 19:00 by ISE’s 10th Birthday Party, to be held in the adjacent Forum Lounge. Admission to both events is free of charge to all ISE attendees.